Remember that cupcake contest I told you about? 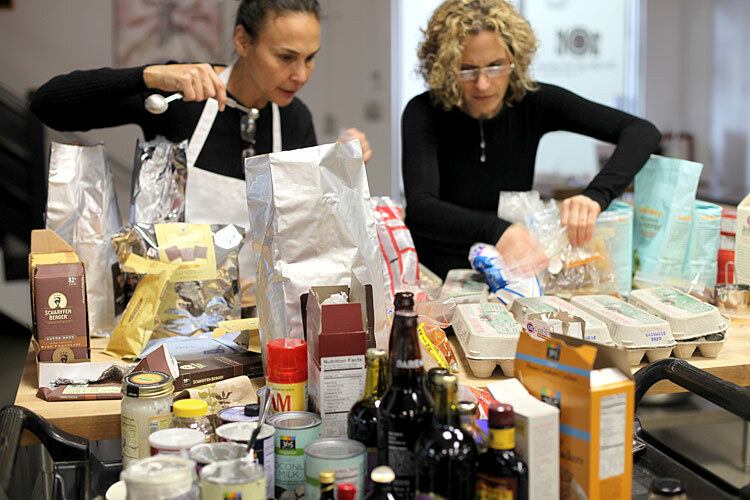 The Scharffen Berger Chocolate Adventure Ingredient Contest? The one with $10,000 up for grabs? It was a while ago. You’ve probably forgotten by now. That’s ok, but that’s why I went to San Francisco this February to begin with. They flew me out there to taste the top cupcakes and help judge to pick the winner. Ridiculous, I know. But, I went across the country from Georgia to California to eat chocolate cupcakes. Adventurous one might even say. Anyway, here are a few behind the scenes of the judging and the winning recipe in case you’ve been wondering. 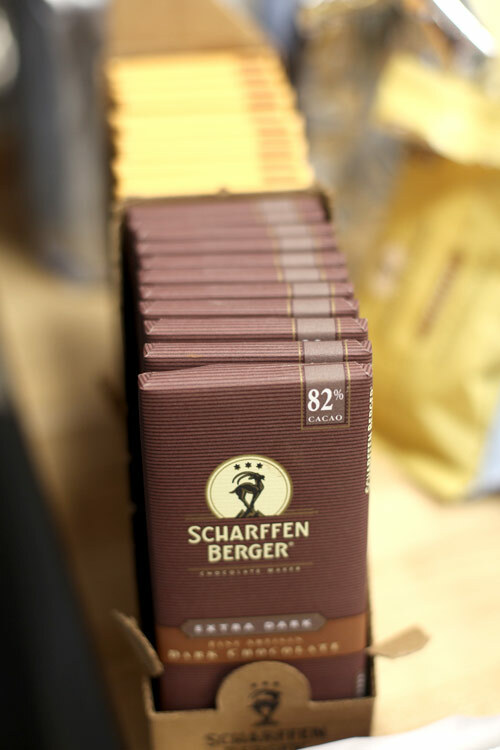 …all of the recipes had to include some type of Scharffen Berger Chocolate. Yes, I know. This was a tough assignment. 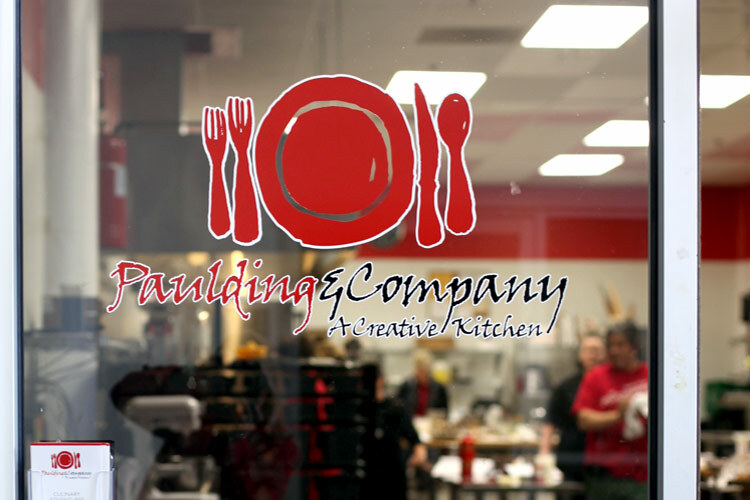 Paulding & Company kitchen. Where it all went down. Look, there’s Matt from Matt Bites. Matt was also one of the judges. He takes pics just like me. Only he’s a bazillion times better at it. 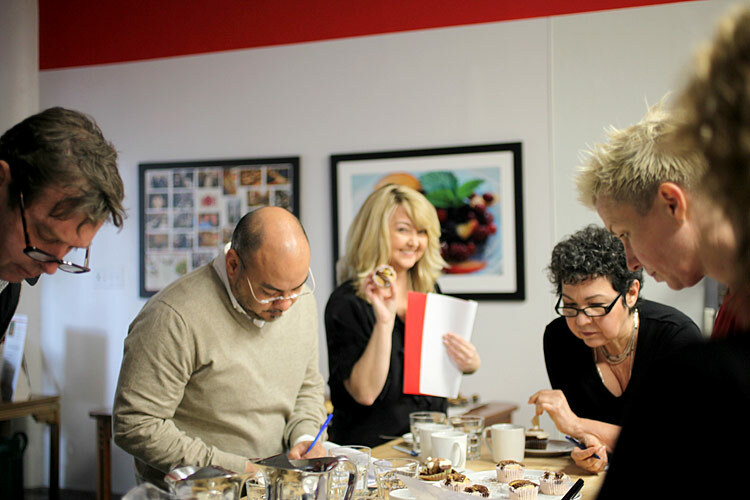 Elizabeth Falkner was another judge. She owns Citizen Cake in San Francisco. 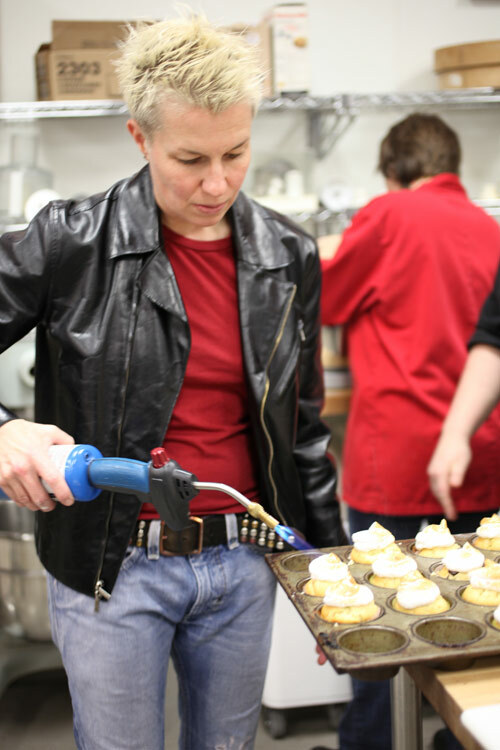 You know how some people exude cool… well, she’s one of them even without a blowtorch. She’s been a competitor and judge on Top Chef, so you may recognize her and her spiky golden locks. That’s Alice Medrich. 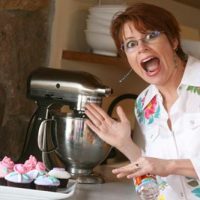 She’s an expert on chocolate desserts and the author of several books. She’s got one I’ve been eyeing for a bit. Chewy Gooey Crispy Crunchy Melt-in-Your-Mouth Cookies. Dang, I should have bought one and had her sign it. Kicks self. That’s me and this is what a dork wave looks like while holding a cupcake. See that guy on the left that looks all serious? That’s John Scharffenberger. He was the fifth judge. These were one of the finalists. 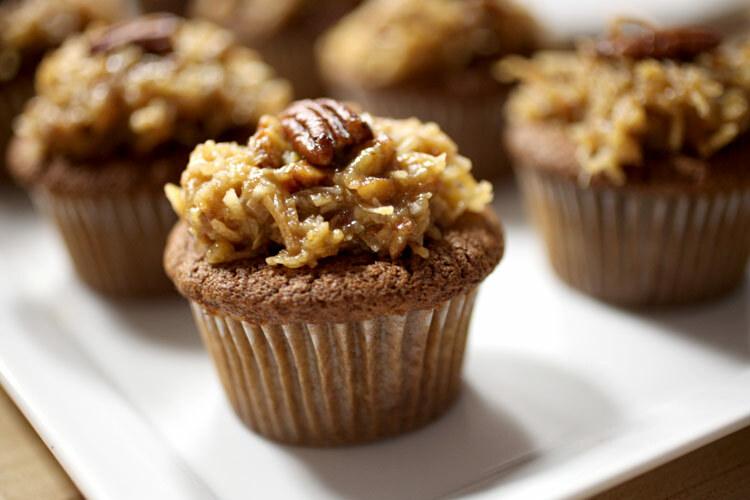 German Chocolate Cupcakes with coconut milk and sumatra coffee beans… another one of the finalists. The candied serrano chiles on this one earned it a second place title and $7,000. 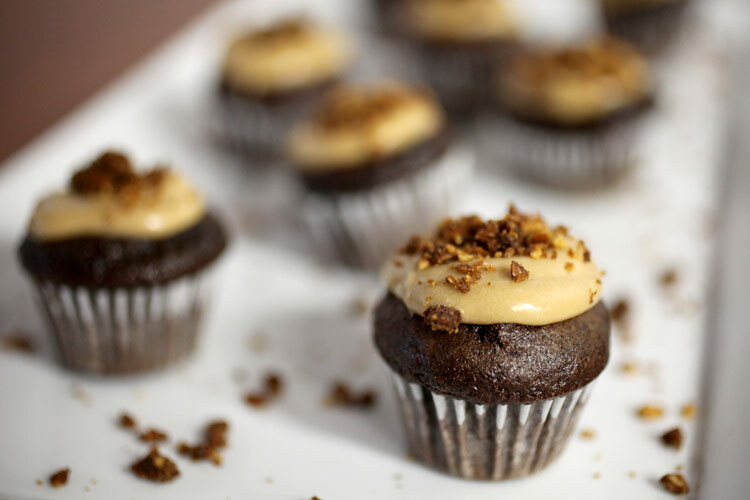 Beer-malt frosting and spicy pretzel crumbles topped these cuties and won them third place and $3,000. Choosing one winner was tough, but we all agreed that these stout cupcakes tasted best. I didn’t get a great photo of them, but feel free to check out all three winning recipes and images here. 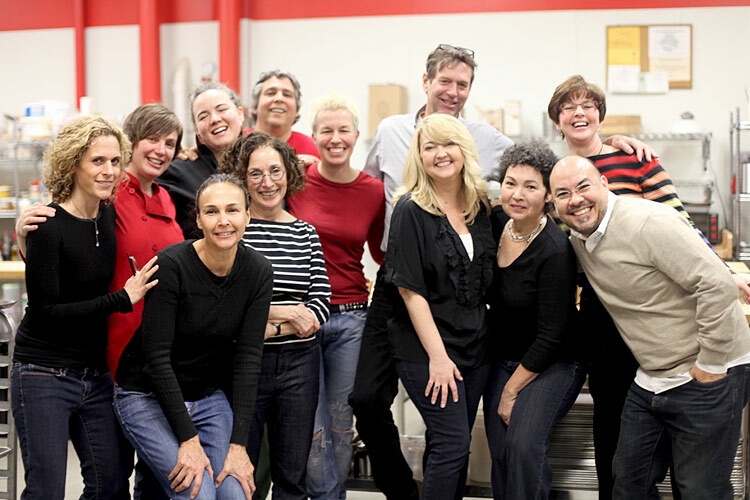 Here’s the whole team… It was a really fun day judging chocolate cupcakes in San Francisco and meeting new people. But, I’ll tell you, I was so happy to finally meet Matt. I’ve had a little blog crush on him for a while. Great design. Beautiful photos. Interesting stories about food and travel. P.S. Matt just published his first cookbook titled, On a Stick. Something tells me we’d get along. I’ve been wondering about this contest! Great update! Looks like you guys had an awesome time! What a great trip! So glad you were able to go. sooooo fun!! Now that’s a group of people that I would love to sit and talk shop with! What a great reason to rub elbows with interesting people! How fantastic….we get to see behind the scenes – the inner sanctum – the jury! Brilliant photo’s and always great to get new recipes and idea’s. Congrats to all the winners. I can’t wait to try out the winning recipe! They all look so good! 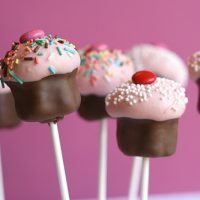 I’ve just discovered your blog after a customer of mine (still can’t believe my passion for cupcakes/cakes has turned into a little business) asked if I do cakepops. 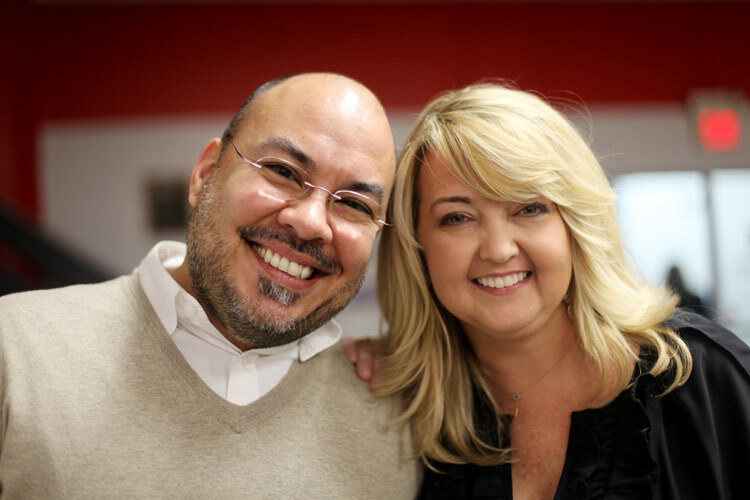 I’m SO glad I found you – what a wonderful resource and inspiration! And the icing on the cake (pun intended) is that I discovered you’re in GA too (as if we might run into each other LOL)! 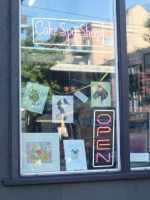 After seeing your CakeArt photo tour post, I’m definitely going to have to venture out there even though it’ll be about an hour drive for me. This looks like a fun event to take part in….and delicious too! P.S. I think your a great photographer in addition to a super creative gal! 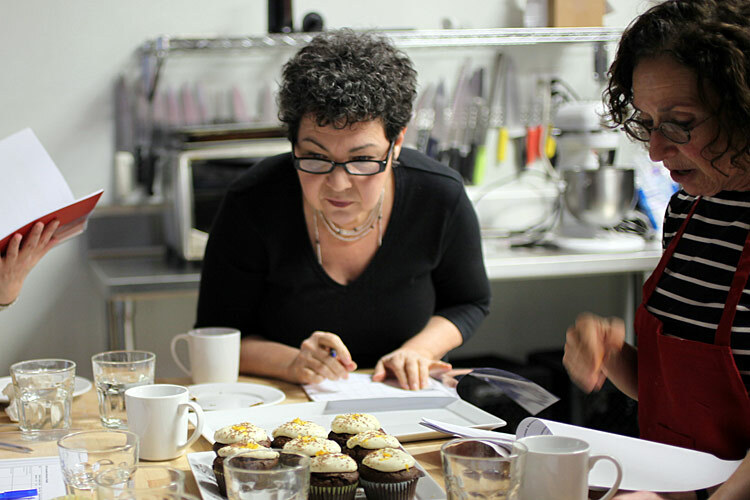 Wow what a tough job… cupcake taste tester and judge… but I guess someone has to do it! Lol! Looks like you had fun and those cupcake look divine. This looks like it was so much fun! Love this. Um, I’ll take your job, please and thank you! Oh, yeah…and your hair, while you’re at it! Dang girl!! You have got some amazing locks! Wow Bakerella! You are lookin’ fab! Seriously though, I am neither fashionista nor a big shopper, but I even noticed your heels! Everything looked amazing though I can’t say beer in a cupcake sounds that tasty, I totally trust your judgement though so it must have been super!  Oh, and I love love love your blog! Wow! Looks like so much fun!! You and Matt look like the perfect couple!! Great story, Angie! What a FAB experience; thanks so much for taking us along with you. I was also hoping to see a kidney update, but I hope no news means what it should….my heart is with you and your mom! ooh!!! amazing experiencia!! i would like to go too!! jeee! I love it when I see new posts from you! I do like the comments about you and Matt! 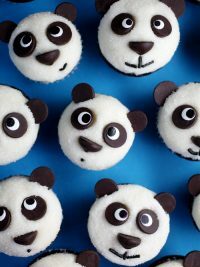 :) The cupcakes look amazing! continuing to pray for your good health!! I think I now know what I am going to (try!!!) 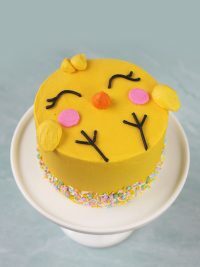 to bake for my husbands birthday this year!!!! As always…THANK YOU!!!! Gah….I am SO jealous! I want your job!!!!!!! Sounds like a delicious adventure! Great photos and wow, those recipes are amazing! okay that looked like way too much fun – how many times did you pinch yourself? I’m only on the second entry on MattBites and I can already see why you have a blog-crush on him. Yay, tacos! What a fun reason to travel…..and what fun hanging out with these adventurous, exciting, creative people. Loved this blog. 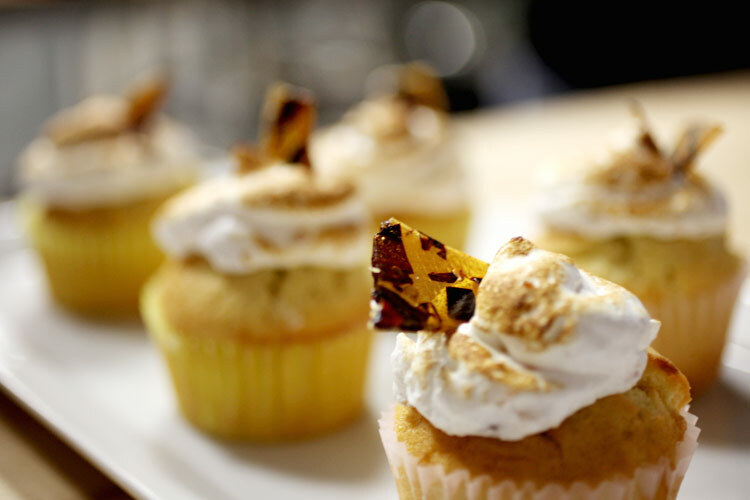 The cupcakes are outrageous AND now I have a new link to drool over…. the Scharffen Berger site! THanks so much for sharing. I have to go back and look at your shoes now . . . oh, OK! I don’t feel so bad about missing them now. I agree w/ the others – very stylish of you!! I dont like the term short or vertically challenged for us less then statuesque gals – I like “fun size” – like a small chocolate bar . . .
Hope you are feeling well ~ you take care now. I’d fly anywhere to eat chocolate cupcakes! ;) they all look sooooo good! Oooh those cupcakes look delicious! I definitely wanted to enter this contest, but I found out about only a week (maybe 2?) before the deadline. I just didn’t have the time to do it the justice I wanted! Hopefully there will be another one, because it looks super awesome! Wow! All of the cupcakes look amazing. I wish I was that creative. Oh my goodness, what an amazing trip! What an honor to be selected as the cupcake taster too. Those cupcakes are so beautiful. Hopefully one day I’ll master that as well! Matt is awesome and so are you!!! WoW!! What an experience! 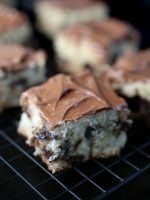 I’d love to make the winning recipe but where can i find milk stout beer? I just asked a Irish beer drinking co-worker and he’s never heard of it. how fun! beer + chocolate + cupcake??? I THINK SO! Oh my gosh… these all look so delicious. How do I get your job?! 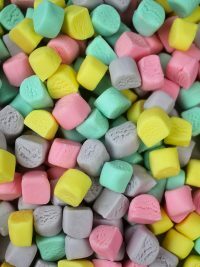 I’ll definitely have to try some of these over the summer. The recipes are a bit intimidating, but I’m sure they are worth it! Honestly, I didn’t think that was the best of the recipes I submitted, but I felt so honored to be a finalist! How fun!! Looks like it was an event to remember. Hello, I sent a message before but just wanted to tell u that since being inspired by u I started a small website and it has really taken off. I am a stay at home mom of 2 and I don’t expect to get rich off cake pops but I love making them and love seeing people smile when they get them. I am wishing u a speedy resolution for your health issues and can’t wait to keep hearing about all ur success and baking adventures…Oh, I also wanted to ask u where can I get black heart shaped sprinkles?? I have only found one place on line and it was a on etsy and they were sold out. I am making panda in the next week or two and I am starting to panic…Thanks for any help u can give!!! Sounds gorgeous to me too! Wich i could have tasted (eaten) all those cupcakes!!! You look so cute, didn’t know you wore high heels! Wow! Those cupcakes and flavour combinations look amazing. Wish I could have been a judge so I could try them all!! 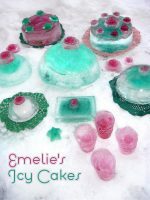 I’ve just found your website and I’M IN LOVE! I just made my frist cake pops (i didn’t have candy melts so I used plain white chocolate) and they are just delicious!!!! Not looking as amazing as yours of course but I’m gonna order your book online and some candy melts and I’ll get better, can’t wait to see all the recipes and make them!!! I’m so happy people like you give your recipes by internet, in Spain is hard to find all these ideas and you make it so easier to be able to cook and make amazing things! Thank you!! I hope some day I can go to america and meet you or that you can come to Europe and make a book tour here!!! I love love love reading your blog and looking at all the lovely treats you make! I’m studying journalism at the University of Portsmouth in England and am writing an article on blogging and would love to talk to you about your experience of blogging and how it’s led to you having your very own (very wonderful!) book. Please let me know if you would be willing to answer some questions for me, I’d be incredibly grateful if you could. LOVE how you always refer to yourself as a ‘dork’. I do that all the time…about myself! You’re so cute and talented :) Thanks for all your inspiration! What a great read. I must say though, it’s not like the Big National “Bake-Off” contest. 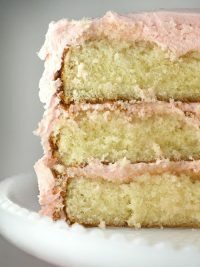 I can’t imagine too many people running out to buy all the ingredients to make the number one cake…that feels more like something a restaurant might try to make a few bucks selling to it’s customers for dessert. Wow! What an incredible experience! Curious, did any of the cupcakes include using olive oil in lieu of other fats? Scharffen Berger Chocolate is awesome! Wish I could go on assignment like this! 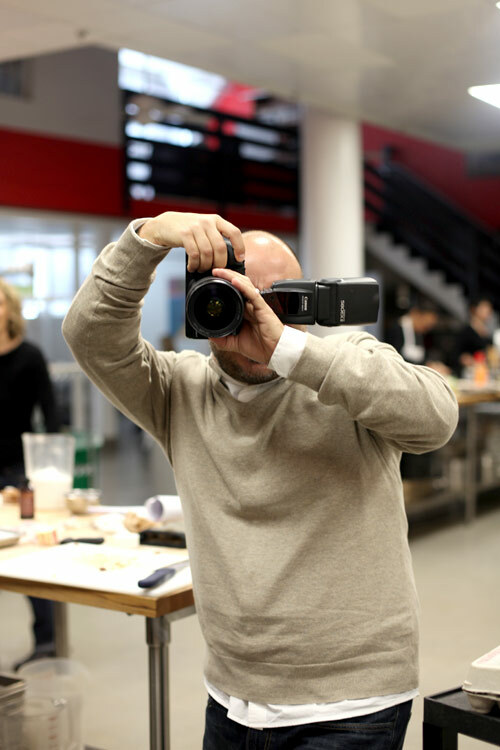 Such a great experience overall…..keep up the inspiring work! Great read~! 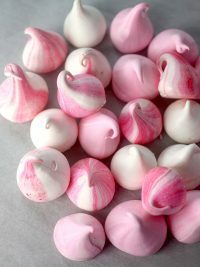 Wow, those sweets look fantastic! My mouth is watering! I actually entered this fun contest with only 1 days notice (in other words, I found out about it at the last minute and went for it anyways :) ) It was really a challenge and I learned all about new flavor combinations. 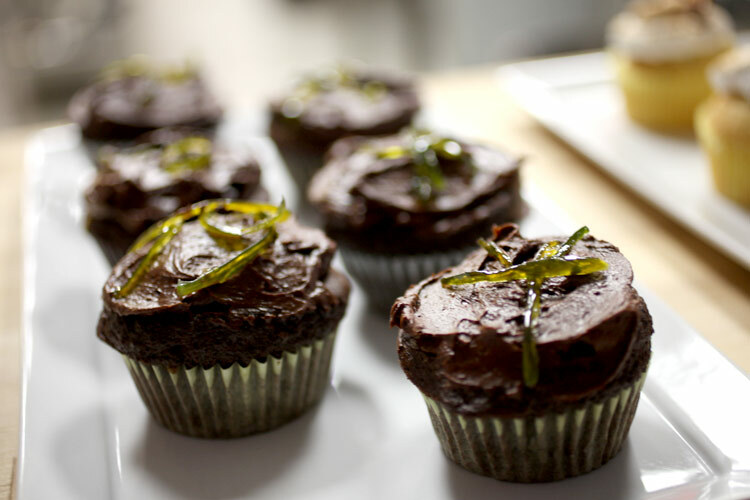 I made chocolate chili cupcakes with coconut milk, chili, and candied lemon slices on top. That looks like such fun. 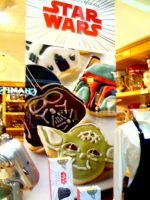 I run across your blog being referenced everywhere, and you deserve it. I hope you are still hanging in and doing as well as can be, while you wait. I have a question and hope you can help. 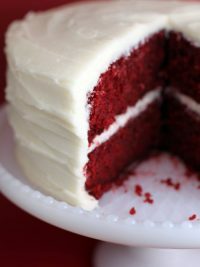 I have looked everywhere close to our house, and not luck, but wondered where you can purchase one of those black markers you can use on your icing? Im jealous!!! I would LOVE to taste test all those cupcakes! : ) I bet it smelled heavenly there! haha! 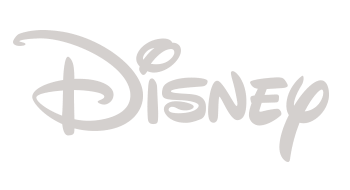 I’m happy you’re still updating the website :) I’m sure we’ll be seeing some brand new creations from you soon. I wish you the best and stay strong! love your cakepopers.one time my mom made cakepops for my granddad and it said FGRANDDAD and it was a joke. not funny. Wow amazing cool! I did a copy of one of them hahaha I bet it wasn’t so good at all :) I love bakerella!!! what an amazing post and event!!! 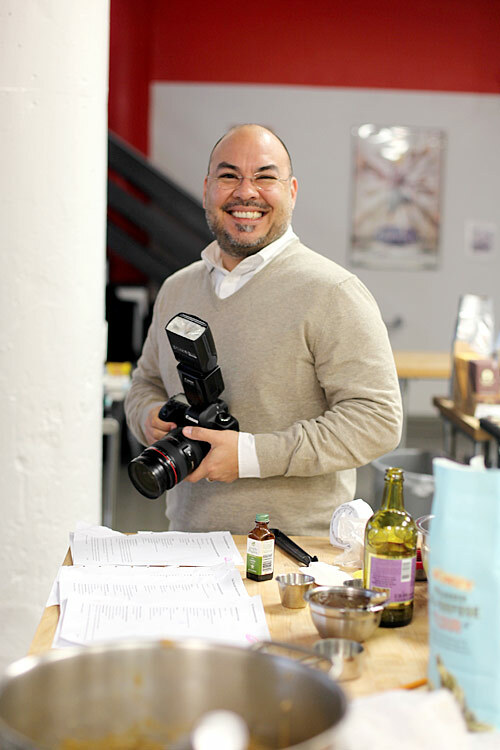 i recently met matt (and adam) at a food styling and photography workshop in LA. I posted all about it. But it was a life changing event. And Matt and Adam are both amazing!!!!! Hope you are feeling okay and all the news back from the doctors are what you want to hear. 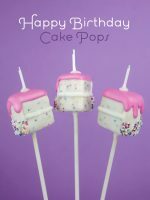 One of the other blogs I read, Bake at 350, made cake pops for you and ate them for you too :)! I love the post and it is so awesome you were a judge. The dork sidewave with a cupcake alternative is just as good :). Feel better! 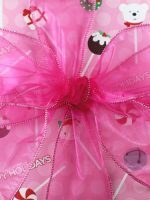 Just wanted to say that I know Elaine Barbee who was the winner of this contest and she is a marvelous cook. She is also a wonderful person. I am so glad she won and love her recipe. 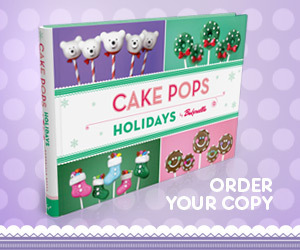 I have your cake pop book and LOVE it. Everyone loves my cake pops. Thanks for your great book. Bakerella! Just found out you posted this experience. I’m so happy to see these phenomenal pictures! You are beautiful! 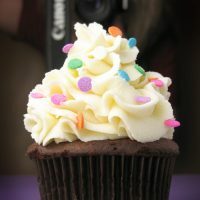 I go to NYC Monday the 16th and I am giving out You Make Me Want to Stout cupcakes on the Sweetery truck in Manhattan. Will you be there? Would love to meet you. Thanks so much for picking my cupcake!  It’s such an honor to be chosen, especially, with you as one of the judges! @ the question about Milk Stout beer its from Left Hand Brewing Co. Out of Colorado. I buy it at Friar Tucks or the grocery store. 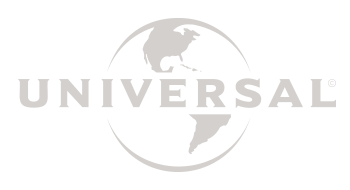 Check their website for distribution sites. I was trying to check out Matts website and its not working, do you know whats going on? I once met and helped Elizabeth Faulkner at Bama R&D lab in Oklahoma for a fun food/science event. I was an intern there for the CIA program. Wonderful lady.. absolutely meticulous. I just wanted to tell you (again… since i’m sure i said this in the past somewhere on here) you are UHHH…MAAAYYY…ZING! 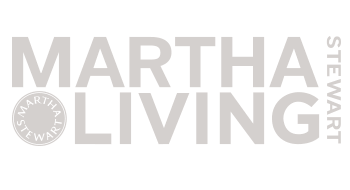 serioulsy, i love all your stuff & your site and the way you blog…. you’re SUCH an inspiration to us “starting-from-scratch” bakers & goodie makers out here… you ROCK girl!!!! Hi, Angie! Sooooo nice to see you blogging gorgeous photos and eats and goodies again! I continue to pray for all things good and positive your way. You’re very special to us! Blessings always! and hugs! Oh man, you lucky girl. You know what contest I want to be a judge at? Memphis in May. Just once in my lifetime. I could die a happy person then. Looks like I missed this years, there’s always time for someone to invite me to next years. Oh wow, you are one lucky lady. What a fun, fun job. Looks like you had a fab time! Looks like so much fun. 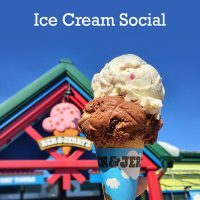 Would love to hear more about your journey into food, blogging, baking, etc. What a fabulous life! I\’m not quite sure how to say this; you made it etxremely easy for me!